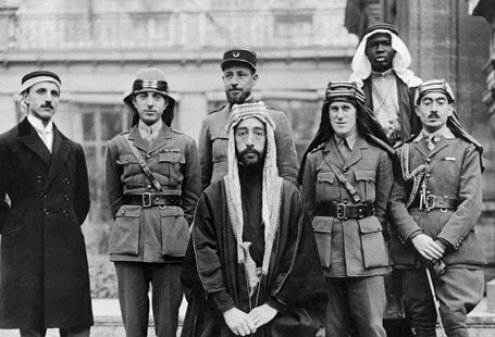 A vanishing order: Emir Faisal, later Faisal I of Iraq, at the Versailles Peace Conference. he 19th and 20th centuries are disappearing before our eyes. So far, however, the world’s political classes, specialists, historians, and economists perceive this reality only dimly. Recently released and disappointing GDP figures for the second quarter of 2014 in Europe and other OECD countries seem to indicate the recession is far from over — but interpreting those figures is a complex task. We need to look very carefully at the impact of deflation and wealth distribution. The fact is our economies may not be shrinking so much as undergoing fundamental changes. In Europe, the idea of the great national state — the great invention of the two previous centuries — seems to be fading away. In its place will be a greater and deeper kind of integration as well as a redefinition of sovereignty. That, in layman’s terms, is more or less what European Central Bank Governor Mario Draghi has been alluding to in recent statements, including suggesting the time might have come for a weaker euro. Among the consequences of the slow decline of national states has been a major shift in the accumulation of social wealth, a change that began in the 1980s and has accelerated in recent years. National governments, even if they wish to reverse this trend toward inequality, lack the financial resources and the political power to do so. Only the embryonic European state has the resources and political clout to close the ever-widening gap between the very rich and the rest of society. The Welfare State, arguably the most important innovation of the 20th-century, can only be saved by Europe, and only Europe can stave off unaffordable national conflicts and beggar-thy-neighbor policies. Recent moves in Brussels suggest that the first, hesitant steps in this direction are being seriously discussed, though their implementation still appears far off. The geopolitical horizon is also in flux. The makeover began in the early 1990s with the dissolution of the Soviet Union and the subsequent creation of new states that have profoundly altered the political map of Eastern Europe and Central Asia. Various conflicts are now brewing in the former Soviet republics, not only Ukraine. But the “winds of change” are also blowing with increasing violence in the Middle East and Africa, fostering new tensions and leading to shock waves that are being felt across the Southern Mediterranean, Near Asia and Africa. The religious, ethnic and economic conflicts rocking the region have just begun and they have explosive if not quite frightening potential. In the short term, the instability in Iraq, Syria, Libya and Sudan has the potential to draw in Iran and Saudi Arabia, not to mention Qatar, with severe destabilizing consequences. The endangering oil and natural gas supplies both to the West and to Southern and Eastern Asia could bring other powers into the conflict. The result could be a complete realignment of the political and organizational structure of several North African, Middle Eastern and Gulf states, most of them created by the Western powers at the end of the World War I during the 1919 Versailles Peace Conference. In Africa, the violent upsurge of Islamic extremism is unsettling post-colonial equilibriums. Something similar happened several centuries ago when Islamic Millenarian shepherds invaded the continent’s sub-Sahel regions and imposed both a new religion and a new economic organization. Among the consequences of the shift was the expansion of the 19th-century transatlantic slave trade, with Sudanese Islamic states playing a major role in feeding the supply. Post-colonial African states lack the power and resources to stem this new surge in Islamic extremism and many of them may not survive in their present form. Increasingly they will have to request the intervention of their former masters, many of them somewhat reluctant to intervene — France has done so in Mali but in a limited way. In the long haul, these developments are likely to change existing equilibriums in a profound and painful way. This has already happened in Sudan, which now consists of two nations, predominately Islamic Sudan and newly formed South Sudan, which embraces both local religions and Christianity. Because the Southern Sahel, the area south of North Africa, and Central Africa are poor and marginal, the turmoil sweeping its states has so far had little impact on Western public opinion. But make no mistake: these are potentially transforming conflicts. The Africa of 2025 may bear little resemblance to its mid-20th-century counterpart. Can these changes, in small or large measure, be brought to heel by old school big-power intervention? I doubt it, and attempting to do so would be extremely costly and very likely beyond the means of a single power. These are changes in the planet’s political magma. The only way to understand it, or at least imagine it, might be to buy a good historical atlas and look to the maps of the past to get a glimpse of what the future may have in store. Vittorio Jucker was the author of the column "The Economist" from its creation in 2012 to mid-2017.